IT OFFERS FUN AT BATH, BEACH, AND POOL TIME, etc. Our children were tired of the thin, scratchy, poor air permeability towels on the market. To recharge the time cosy and fun, we designed this highly absorbent, ultra breathable and silky smooth hooded towel with bright colorful animal theme. 100% Premium Natural Cotton .you and your child will enjoy using this towel for many years to come. The breathable, plush material is pleasing against the skin and naturally soft to the touch, gently snuggling kids dry time and time again. Perfect Towel Indoors and Out. Headed to the beach or pool? 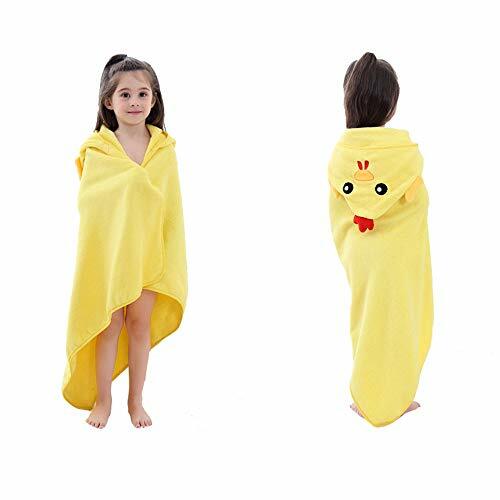 This is the perfect towel to dry and cuddle your little one after pool time or a day at the beach, just drop it on your kid's head so he/she can enjoy the water and dry off quickly! The natural cotton starts out plush, and then becomes softer & more comfortable with every wash.